HSE have become aware of dangerous occurrences during the raising and lowering of waste container skips from hook-loader vehicles. This note highlights the potential for similar failures, and action that can be taken. 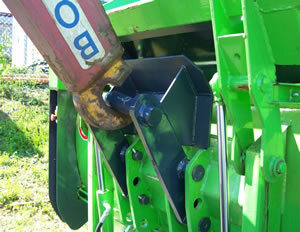 Mismatch can occur due to the lifting hook slipping behind the hook bar fitted to the container skip, or by the lifting hook connecting to the wrong part of the container framework. The operator of the lifting mechanism is typically located within his vehicle cab during loading and unloading, away from the hook . Within the UK, historically lifting hooks and container-skip hook bars are built to the CHEM (Container Handling Equipment Manufacturers) guidelines. Construction to these guidelines will ensure there is insufficient space within the container skip framework for the lifting hook to pass under and there are no other parts of the skip to inadvertently connect to. However, it cannot be assumed that all hook-loaders and container skips will be built to compatible standards. Whilst other designs may not be inherently unsafe suppliers, hirers and operators of equipment should ensure that hardware measures, information, instruction and training are provided to control the risks of mismatch. When purchasing or hiring hook-loader vehicles and container skips you should specify clearly their intended purpose – making clear the extent or limitations of compatibility between the lifting mechanism and the container hook bar. Manufacturers are required to declare the harmonised and national standards, codes of practice etc that equipment is constructed to. Retrofitting a backing plate to the hook assembly of existing containers will physically reduce available space for the lifting hook to pass behind. Always consult with the manufacturer of the container or carry out suitable and sufficient engineering analysis to ensure that alteration of the framework by welding, bolting etc does not distort of weaken the hook connection. The hook bar is considered to be part of the load being lifted and any modification made to it should be suitable for purpose and be inspected/ maintained (PUWER regulations 4 & 5). The connection between the lifting hook of the vehicle lifting mechanism and the container hook bar should be checked to ensure it is ‘slung’ correctly. This may be carried out by the driver of the hook-loader vehicle, or an independent slinger/ banksman. The driver applies the cab parking brake before exiting the vehicle cab. The banksman remains in a safe position away from the load being lifted.